A3 Size 10.7 x 14.4 in. (272 x 365 mm) 11.7 x 16.5 in. THANGKA 16.9 x 22.7 in. (428 x 578 mm) 16.9 x 22.7 in. NOTE: The original unbrocaded thangka of this unique composition by Sunlal is for sale, Priced at GBP £1,650.00. Dominating the centre of this composition is Dorje Bernagchen (Tib. rdo-rje ber-nag-can), the “Great Black-Cloaked Vajra”, and dwarf form of Mahakala, who serves as both a personal protector to the lineage of Karmapas and as a special protector of the Tibetan Karma Kagyu tradition. 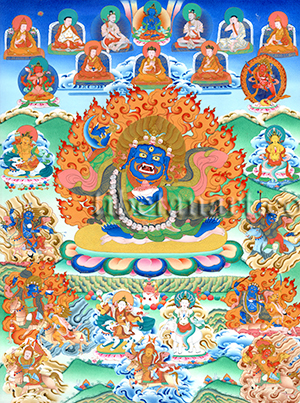 Dorje Bernagchen is extremely wrathful and blue-black in colour, with a large ‘cloud-shaped' face that is equal in height to his squat pot-bellied torso. He has three bulging red eyes, a large gaping mouth that reveals his sharp teeth, fangs and twisting red tongue, and fiery upward-blazing facial hair. His tawny-red hair streams upward above his five-skull crown and serpent-bound topknot with its crowning half-vajra. He leans towards the right in pratyalidha posture, with his two feet trampling upon the naked human corpse that lies upon the golden sun disc of his lotus-seat, which in turn rests upon a vajra-rock formation. He abides within a blazing mass of awareness-fire and wears an undergarment of embroidered green silk, a tiger-skin loincloth, and a billowing outer-robe of black silk that is described as having eight folds and being embroidered with various weapons. A long poisonous serpent encircles his body as a sacred-thread, and a garland of fifty freshly-severed heads hangs from his neck. With his right hand he wields aloft a fiery crescent-shaped chopper or curved knife with a vajra-handle. And with his left hand he feeds a skull-cup filled with warm blood and the heart of an enemy towards his mouth. Above at the top centre is the primordial or Adi-Buddha, Vajradhara (Tib. Dorje Chang), the “Vajra-holder” and progenitor of all tantric transmissions of the Tibetan Kagyu lineages. Vajradhara is deep blue in colour, and holds a vajra and bell in his crossed right and left hands in vajra-humkara-mudra. He is adorned with the thirteen silk and jeweled ornaments of a sambhogakaya deity, and sits in vajra-posture upon a white moon disc and lotus-throne. Flanking Vajradhara to his right and left are the 11th century Indian mahasiddhas, Tilopa (holding a fish), and his disciple Naropa (holding a skull-cup of nectar). At Tilopa’s right is Marpa Lotsawa (1012-1097), or “Marpa the Translator”, who founded the Tibetan Kagyu Tradition; and to the left of Naropa is Marpa’s famous disciple Jetsun Milarepa (c. 1052-1135). Below Marpa and Tilopa is Milarepa’s disciple Gampopa (1079-1153), who holds a blue jewel. Below Vajradhara is the First Karmapa, Dusum Khyenpa (1110-1193), and below Naropa and Milarepa is the Eighth Karmapa, Mikyo Dorje (1507-1554). To the right of Marpa (top left corner) is the 1st Jamgon Kongtrul, Lodro Thaye (1813-1899), and to the left of Milarepa (top right corner) is Jamyang Khyentse Wangpo (1820-1892). Below Jamyang Khyentse Wangpo in the upper right is Vajravarahi, the ‘Vajra Sow’, and consort of Chakrasamvara who is of special importance as a tantric yidam deity within the Kagyu traditions. She is semi-wrathful, ruby-red in colour, and stands in dancing bow-and-arrow posture upon a golden sun disc above a corpse, a white moon disc and a lotus. Vajravarahi is youthful and passionate with three eyes, and her naked body is adorned with gold and bone ornaments, and a long billowing red silk scarf. Her tawny-yellow hair streams upward above her five-skull crown, with the squealing head of a black sow protruding above her right ear. The sow’s head represents the ‘absolute truth’, and her human head the ‘relative truth’. With her raised right hand she holds a vajra-handled curved knife, and with her left hand she holds a blood-filled skull-cup in front of her heart. The long shaft of her khatvanga or tantric staff rests in the crook of her left arm, and she abides within a blazing aura of awareness fire. Below Jamgon Kongtrul in the upper left is Jinasagara, meaning the ‘Ocean of Conquerors’. This four-armed aspect of red Avalokiteshvara with his consort is an important Highest Yoga Tantra yidam deity practice of the Karma Kagyu School, where his five-deity or nine-deity practice is performed in their traditional three-year retreat. Incarnations of the Karmapa and Dalai Lama are all recognized as manifestations of Avalokiteshvara, with the Dalai Lama being identified with white four-armed Avalokiteshvara, and Karmapa with his red four-armed emanation as Jinasagara or Gyalwa Gyatso. Gyalwa Gyatso is peaceful and ruby-red in colour, with four arms and two eyes, and sits in vajra-posture upon a white moon disc and lotus in sexual union with his red consort, Vajrayogini. He is adorned with the thirteen divine silk garments and jeweled ornaments of a sambhogakaya deity, and with his first two hands he embraces his consort, with his palms-folded in front of his heart as he holds a blue wish-granting gem. With his second right hand he holds a golden vajra, and with his second left hand he holds the stem of a red lotus. His consort, Vajrayogini, is lighter red in colour and slightly wrathful, and her naked body is adorned with golden ornaments. With her left hand she holds aloft a blood-filled skull-cup, and with her right hand she holds a curved knife as she embraces the neck of her lord. Below Jinasagara is the wealth deity and worldly protector, Yellow Vaishravana, the ‘Lord of the yakshas’, who appears here as the ‘Great Lion-riding King’. His body is corpulent and golden-yellow in colour, with two arms, a mustache, a slightly wrathful face, and two round piercing eyes. He wears a black jeweled hat, golden ornaments and silk garments, and sits in a posture of royal-ease upon a roaring white snow-lion with a turquoise mane. With his right hand he holds the shaft of a jewel-topped victory banner, and with his left hand he holds a treasure mongoose that disgorges a stream of wish-granting gems from its mouth. The lion crouches upon Vaishravana’s golden sun disc and pink lotus, with its ferocious head turned back and its two baleful eyes fixed upon the mongoose. In front of the lotus throne are precious gemstones and emblems of a 'universal monarch' or chakravartin (elephant’s tusks, coral, conch, general’s lozenges, queen’s round earrings, and minister’s square earrings). Below Vajravarahi is Lu Gyelpo (Tib. klu’i rgyal-po), the ‘Naga King'. He is also known as the ‘Servant Mantra Lord’, with his mantra giving his Sanskrit name as Nagarajamantrapati, the ‘Naga King, Lord of Mantras’. Lu Gyelpo is orange-yellow in colour, with the upper part of his body being human in form, while his lower part is that of a serpent. His coils rest upon a white moon disc and an eight-petal pink lotus that arises from a lake, and with his two hands placed palms together in front of his heart he clasps a wish-fulfilling gemstone. He is beautiful, peaceful and youthful, adorned with various jeweled ornaments and wears a billowing red silk scarf and a loincloth, and a canopy of seven small naga-serpents ascend above his jeweled crown and topknot. Below the Naga-King Lu Gyelpo is Garwa Nagpo (Tib. mgar-ba nag-po), the ‘Dark Blacksmith’, who serves as the principal ‘minister’ or emanation of the oath-bound protector, Damcan Dorje Legpa. The Dark Blacksmith is extremely wrathful and blue-black in colour, with one face, two arms, three round red eyes, and a gaping mouth that reveals his four sharp fangs and twisting red tongue. His facial and tawny-yellow hair blazes upward like an uncontrollable forest fire. He wears golden ornaments, a five-skull crown, white-soled felt boots, and nine garments of green, red and black silk that are embroidered with gold designs of wrathful weapons, particularly open-pronged vajras. With his right hand he wields aloft his indestructible foundry-hammer, with which he crushes and pulverizes the enemies of emotional defilements. The hammer’s head is fashioned from a solid lump of cast iron, with a jeweled handle and is sealed at its top with three half-vajras. With his left hand he pumps wind through his tiger-skin bellows, which blows all enemies into dust. His vehicle is a blue male goat with twisting blue horns, which he rides amidst a maelstrom of storm clouds. Below the ‘Dark Blacksmith’ is the wrathful form of Sringon Thod Tengwa Chen (Tib. srin mgon thod phreng can), the ‘Lord of the Rakshasas with a Garland of Skulls’, and his consort. He is deep blue in colour, with one face and two arms, and stands in pratyalidha posture amidst a swirling mass of fire and above a turbulent ocean of blood, with his left foot trampling upon a human corpse, and his right foot trampling upon the corpse of a horse. He has three round red eyes, a gaping mouth with four sharp fangs, and upward-blazing facial hair. He wears gold and bone ornaments, a five-skull crown, a garland of dry white skulls, and his long dark brown hair-locks drag upon the ground. He wears a tiger-skin loincloth and embroidered robes of black silk that billow loosely around his body. With his right hand he wields aloft a skull-topped red-sandalwood club, and with his left hand he holds a skull-cup full of blood in front of his heart. The skull-club symbolizes his conquest of the three worlds of gods, demons and men; and the skull-cup that he drinks the blood of enemies who have broken their commitments. To his left is his consort, Srinmo Jigje Barwa Marmo (Tib. srin mo ‘jigs byed ‘bar ma dmar mo), the ‘Mistress of the Rakshasas, the Blazing Red One’. She is very wrathful and orange-red in colour, with two arms, sagging breasts, three round red eyes, a gaping mouth with sharp teeth and fangs, and upward-blazing facial hair. Her naked body is adorned with golden ornaments, a human-skin shawl, a five-skull crown, and a tiger-skin skirt. With her right hand she wields aloft a sharp iron sword with a curved blade, and with her left hand she holds a skull-cup full of blood. Below Yellow Vaishravana is Shri Devi (Tib. Paldan Lhamo) in her form as Rangjung Gyalmo, the ‘Self-Created Queen’, who rides side-saddle upon her mule amidst a maelstrom of storm-clouds and above a swirling ocean of blood. The flayed skin of a cannibal-demon encircles her mule, with its head hanging downward and its limbs knotted horizontally around the mule’s body. The mule’s reins are fashioned from poisonous serpents, and Shri Devi's magical weapons of a ‘ball of variegated thread’, and a ‘skin-sack of contagious diseases’, hang from her saddle. Her mule has three eyes that gaze over the past, present and future, with the third 'eye of the future' on its rump. Rangjung Gyalmo is extremely wrathful and blue-black in colour, with four arms, three round red eyes, a gaping mouth, sharp fangs, and upward blazing head and facial hair. She wears gold and bone ornaments, a five-skull crown, silk garments, and a billowing outer robe of embroidered black silk. With her first right hand she holds aloft a skull-topped trident, and with her second right hand she holds a dart (Skt. bhindipala) made from meteorite iron with a flight of three peacock feathers. With her first left hand she holds a magical mirror that faces forward in front of her heart. And with her second left hand she casts a serpent or rope-noose. Below Ranjung Gyalmo is Kshetrapala or Shing Kyong (Tib. zhing-skyong), the ‘Protector (pala) of the Fields’ (kshetra), with ‘fields’ referring to the eight great meeting-places or sacred tantric sites of ancient India. Kshetrapala is the yaksha form of lion-headed Simhamukha Mahakala; and as an emanation of Four-armed Mahakala he is likewise a protector of the Chakrasamvara Tantra Cycle, whose sacred site is Tsari Mountain in southeast Tibet. As a field-protector he guards the Buddha Fields, and especially serves as a protector for Sukhavati or Dewachen (Tib. bde-ba chen), the Pure Land of Amitabha Buddha. He is venerated in both the Nyingma and Kagyu traditions, and serves as a Karma Kagyu protector for the Benchen Monasteries in Nepal and Tibet, where he is particularly associated with the lineage of Sangye Nyenpa Rinpoche. Kshetrapala is black ‘like monsoon rain clouds’, with a ferocious lion’s head, two round red eyes, sharp white fangs, a twisting red tongue, and an upward-blazing tawny mane. He wears gold ornaments, a five-skull crown, felt boots, a green inner robe and a billowing outer robe of embroidered black silk, and a quiver hangs at his left side. With his right hand he brandishes a long spear-flag with a flowing black silk pennon, and with his left hand he lifts a vast skull-cup that contains three fiery offerings of ‘ritual cakes’ or tormas. His mount is a brown horse with a red silken saddle, which he rides swiftly amidst a blazing mass of fire. To his left is his consort, ‘The Lion-headed Demoness’ (Tib. bdud-mo seng-gdong ma), who rides upon a brown horse amidst a maelstrom of wind. She is fiery orange-red in colour, with the fierce head of a lioness, two piercing red eyes, sharp white teeth, a twisting red tongue, and a tawny red mane. She wears gold ornaments, a five-skull crown, a tiger-skin loincloth, and a human-skin shawl is draped across her shoulders and back. With her left hand she feeds the warm heart of an enemy into her mouth, and with her right hand she wields aloft a skull-topped trident. At the front and rear of their two horses appear Kshetrapala’s two monkey attendants, who run on their hands, with their feet supporting skull-cups that contain fiery triangular 'ritual cake' or torma offerings. To Kshetrapala’s right is Tashi Tseringma, the “Auspicious Long-life Lady”. She is the principal deity in a group of five female protectors known as the Tashi Tsering Chenga, or the “Five Auspicious Long-life Sisters", who are particularly associated with the lineages of Padmasambhava and Milarepa. Originally this group of aboriginal mountain deities were associated with a five-peaked mountain on the border of Tibet and Nepal, which is usually identified with the Everest range or with the Gaurishankar range. In Tibetan Gaurishankar mountain is still commonly known as Jowo Tseringma. Tseringma is white in colour with two arms, two eyes, and a blissful yet slightly fierce facial expression. She is venerated as the foremost dakini for bestowing longevity, and appears here amidst billowing blue clouds as she sits upon the silk saddle-cloth of her roaring white lion vehicle, which has a turquoise mane and tail. She wears divine silk garments, gold ornaments, and her long black hair is piled up in a topknot above her five-jeweled tiara. With her right hand she holds aloft a golden five-pointed vajra, and with her left hand she holds a nectar-filled golden longevity vase in front of her heart. To the right of Tseringma is the Naga King, Karnag Dorje Gyalpo (Tib. mkhar nag rdo rje rgyal po), the "Vajra King of the Dark Citadel", who is a local protector of Tsurphu Monastery, the Karma Kagyu seat of the Karmapas in central Tibet. He may be depicted as blue-black or white in colour, and appears here with a white human upper body, and a serpentine lower body. He sits upon a white elephant that stands on a white moon disc and a lotus that arises from a lake. With his two hands placed palms together in front of his heart he holds a wish-fulfilling gemstone. He is beautiful and youthful, adorned with various gold and jewel ornaments, an apron and a billowing silk scarf and crown-ribbons, and above his jeweled crown and topknot is a canopy of seven small naga-serpents. Across the bottom of this composition are three horse-mounted worldly deities of the drala or ‘warrior-class’ of Buddhist protectors, who are often difficult to identify. They each ride upon light-brown horses amidst smoke or clouds and carry a quiver, arrows or a sword. In the bottom left corner is the legendary Tibetan warrior-king, Ling Gesar Norbu Dradul. He is white in colour and wears armour, a pennant-topped helmet, and a golden divination mirror hangs over his breast. He holds a jewel-topped riding-staff in his raised right hand, and a billowing red spear flag in his left hand. At the bottom centre is one of the eight horse-riding attendants of the wealth deity Jambhala, who wears armour and wields a jewel-topped staff in his right hand, and a treasure-disgorging mongoose in his left hand. In the bottom left corner is Tsi’u Marpo, the great worldly protector and chief of the wrathful red tsen or ‘might-demons’, who often appears with his six ‘blazing-brothers. Tsi’u Marpo was oath-bound by Padmasambhava and later served as the principal guardian of Samye Monastery in Tibet. He is wrathful and red in colour with three eyes, sharp fangs, and his tawny hair streams outward above his five-skull crown and topknot. He wears red silk garments, felt boots, and a silver divination mirror marked with the syllable HUM hangs above his breast. With his right hand Tsi'u Marpo wields aloft a red spear-flag. And with his left hand he feeds a blood-dripping heart towards his mouth as he holds a long rope-noose with which he snares an enemy demon.